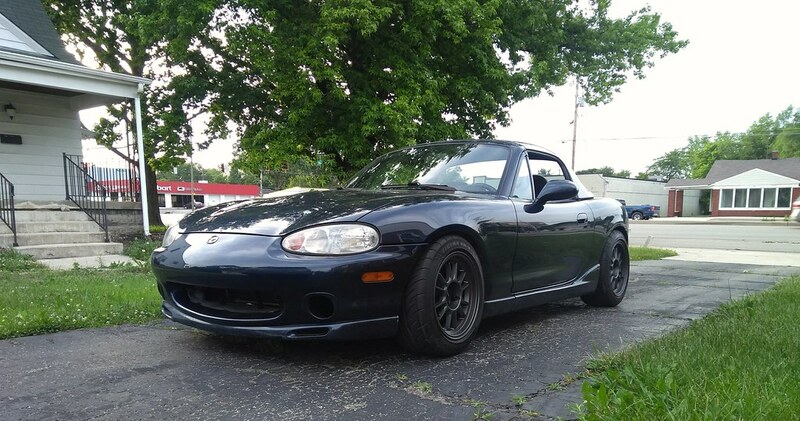 1999 Twilight Blue LS 57k miles - Miata Turbo Forum - Boost cars, acquire cats. There's a build thread here for the car too. "In Which I Build A Street Car." Build thread here, mostly up to date. Why: Because this car is being wasted on a 3.2 mile commute. All interior switches/panels updated to NB2 pieces for amber/red backlighting, the correct way. Including HVAC panel. Hater's infamous "Zyduhz." Whitener-valved MSM bilsteins, Bauer LTD sleeves/perches (circlip relocated on shocks lower to avoid cutting sleeves), Eibach sliders, Hyperco CS100 tender springs, Hyperco 700/400 main springs, custom cut bumpstops, Maruha 20mm extended top hats front, Vteckiller2000FAB 2" extended hats rear. EMISSIONS HAVE BEEN REMOVED. CA RESIDENTS NEED NOT APPLY. Morimoto LED 3" fog lights and necessary brackets/hardware to mount, includes yellow LaminX film pre-cut for these. KA Injection aluminum "unicorn bracket"
This thing is sticky, makes good noises, has great power, pulls hard, runs like a top, has cold AC, rides great, looks incredible. You can add your own stereo and swap in the lighting products i have for ultimate street car Miata, or you can simply add a roll bar and seats for a ready-to-rock track car. I SUSPECT that this car would be faster around a track than Hater. It certainly makes more power, runs better, and is less aero-limited due to having a stock body and a not-stupid wheel/tire setup. Fresh 60k service including all fluids. (It wasn't even due.) Amsoil in the diff/trans, Rotella T6 in the engine, ATE200 in the hydraulics. Replaced all clutch hydraulics at the same time. The entire build has about 2000 miles on it. The car is generally in incredible condition for something that's nearly 20 years old at this point. The only real noticeable cosmetic blemishes are a couple weird dents in the hood (they aren't large, but they are there), and the bottom hardtop trim/welting is old/brittle/not adhering well. It should be replaced, or removed entirely. I see lots of hardtops without this part at all. There isn't a stereo. I haven't gotten to that. Circumstances dictated that i needed to press this into DD service before i had time to finish up the last of the non-mechanical things. It's a little loud inside. The exhaust is pretty quiet, but deep. It may be resonating a bit, but i think the bulk of the noise is due to the motor mounts. The lower durometer (and much bigger bushing'd) V8R engine mounts are to correct that. Yes.... i really did say $12k. You're going to have a rough time finding an NB with these miles in this condition, let alone one that's been COMPLETELY gone through like i did with this. That said... if you're looking for a stock car to build yourself, click the back button. If you're looking for a car that's built anything like this and want to save a few grand (i feel sick), this is your car. Buy now. Just out of sheer morbid curiosity, I wonder whether this setup would pass our local OBDII reading, CEL code only smog inspection. Bump for a clean machine. JDM ECUS aren’t OBD2 compliant, so it won’t return a ready state. If it involves someone plugging into the OBD2 port, it will not. OBD2 is completely non-functional as far as i can tell. I can include the original ECU with sale, but the last time i hooked it up was to set the tach. It didn't run well on the original ECU anymore. It runs like a beast with the 5A ecu though. Feels more like a VVT car, positively meaty low/midrange. Is chevron blue similar to twilight blue mica ?? ?